Relational data can be found in many data sets but it is often tedious to extract. To help you find the networks hidden in your data sets, we've written a script for the Excel-plugin DataNitro that can extract information about nodes and the relationships between them. The following is a demonstration of how the script is used to extract a list of nodes and a list of edges from a data set with incorporated relational data. Followed by a description of how to adapt the script to your own code. This script will construct a traditional network (an one-mode network) where all node can be connected directly to one another. See the last paragraph for scripts for two-mode networks. 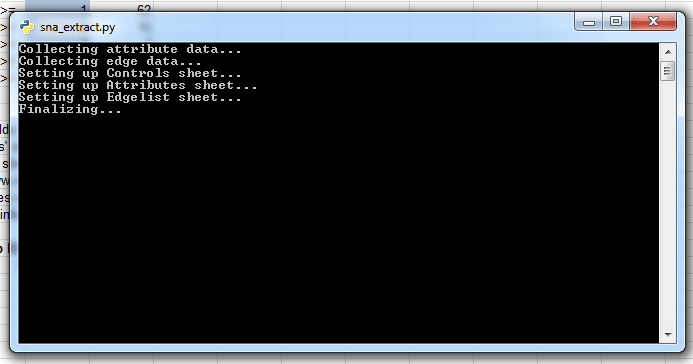 Once you've opened the Excel-file, navigate to the DataNitro pane in the top and click 'Import script'. Load the Python script (sna_extract.py) you downloaded earlier and click 'Run'. As the prompt closes you'll be shown the 'Controls' sheet. This sheet gives you instructions on how to proceed and also allows you to adjust thresholds for the ratings. Ratings are used to show the strength of a relationship. 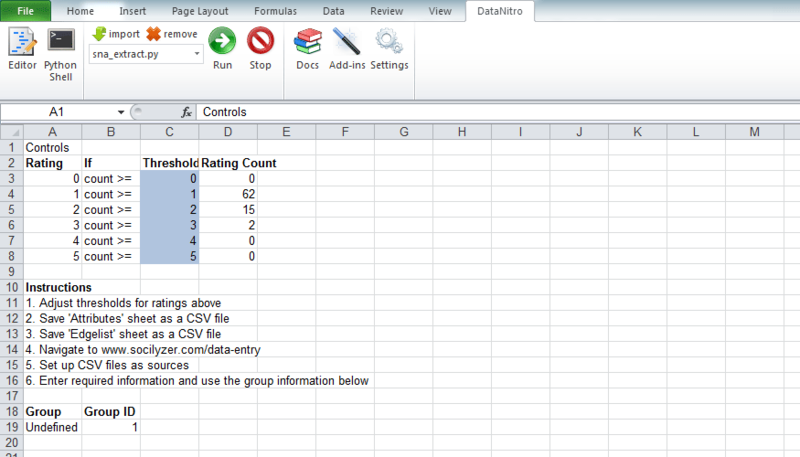 The column on the far right titled 'Rating Counts' shows how many of each rating can currently be found in the list of relationships. This last column is updated as the thresholds are changed. To use the extracted data export the 'Attributes' and 'Edgelist' sheets as Excel files. rater_nodes should equal any cell in the column where start nodes are listed, i.e., the origin of a relationship. rated_nodes similar to the variable above, rated_nodes should be any cell in the column listing end nodes, i.e., the destionation of a relationship. ignore_first_line should be set to True if headlines are used in the data sheet. Relational data can also be extracted directly from a database using SQL. The example queries below use this publicly available dataset. 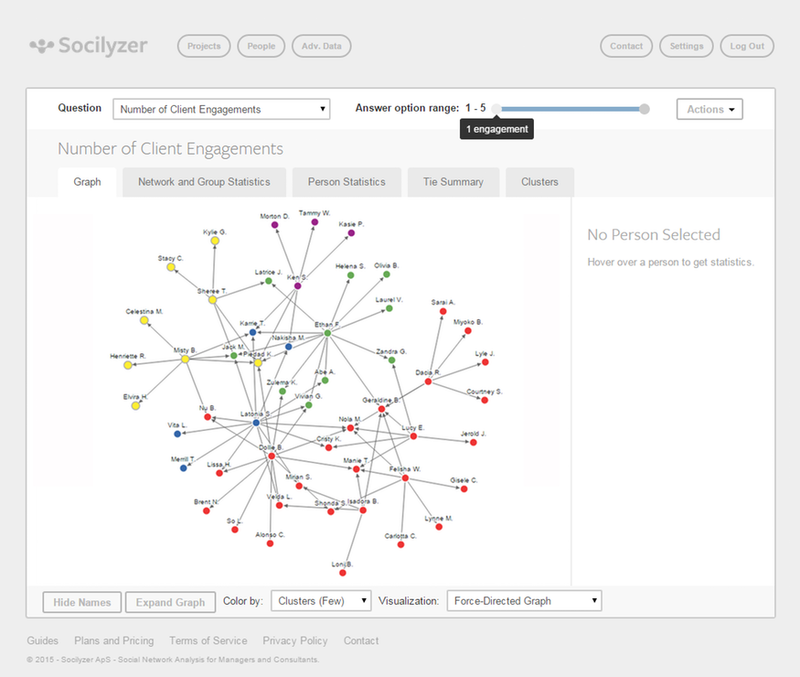 For data sets with two node sets (e.g., clients and sales people) you can construct a two-mode network where each node set is connected through the other node set. To help you extract such information you can use this DataNitro script. A two-mode network can also be converted into an one-mode network where the number of shared intermediate nodes (second node set) determine the intensity of the relationship between the two nodes. As an example, two sales people can be strongly connected because they share many clients. This script helps you extract such information.